Bistro Kai - Great Oysters, Great Desserts, Great Rooms! If you ever need a place to unwind after work, you need to read on. 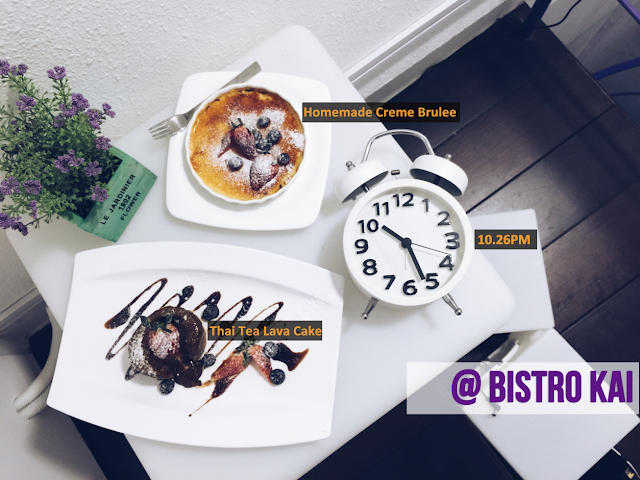 Bistro Kai is one of those hideout that is nestled right in the heart of Bugis, City Hall and Dhoby Ghaut. Subtly hidden away from the hustle and bustle from the city, this is now one of the place I would go to if I want to get away from the hustle and bustle of the city. Plus, the food is AWEEESOMEEEEE. Promotion: Order any ala carte dish to enjoy these oysters at only $2.50/pc (min 6 pc). And, unlike other establishments where they set a maximum limit which you can buy, Bistro Kai is more than happy for you to devour the whole of their oysters stock. Imagine, just you and your best mate, and a dozen or two of these fresh oysters and a pint of ice, cold beer... dude, that's how you should relieve your work stress every night. Can I declare this to be one of the best dish to pair with beer? This baby squid was fried to crispiness and served with a side of sweet dipping sauce. It was like eating fries, but with a sweeter, chewier texture. The handful of seaweed also added a very fragrant touch to the whole dish. ORDER THIS TO GO ALONG WITH YOUR DRINKS! Nope, you are not hallucinating. If you thought you smelled something spicy, you are right, the smell is wafting out from this picture. These Buffalo Wings are fried and coated with hot pepper sauce - which explains its intimidating color, especially for those who cannot handle an ounce of spiciness. "My face when those wings reach my bowels"
Not kidding. This is hot. At least a #3.5evilbeans hotness. This dish looks very unassuming, but trust me, if you love broccoli and you love eggs, you would LOVE this dish to bits! The runny 63 degree egg and those sesame gave the broccoli a very rich, fragrant taste. Plus, if you haven't already know, broccoli is one of those "negative-calorie" food (or so I would like to believe), while eggs are widely regarded as one of the best food for weight loss. This dish proves that healthy food can be tasty! This is one of those food where you either love it or you hate it. I did not really like it as it was bitter and left an aftertaste. However, if you love brussels sprout, you might love this dish to bits, especially with the interesting addition of pickled beetroot. One of the thing I like about this dish is that they serve this Spicy Tom Yum Risotto with TIGER PRAWNS. Tiger prawns are always welcomed into my mouth. Plus, they managed to grill or torch the prawn to almost perfection with a nice charred taste on the outside while retaining the juicy, firm flesh on the inside. The risotto was wonderfully cooked - not too hard and not too soggy. The spicy tom yum base was a genius move to counteract the usual "gelat" effects we get from heavy cream-based risotto. How can one resist NOT eating this after reading their description of this Kaibonara? "A poached egg nestled on a bed of linguine with bacon, prawns, cheese, garlic, chilli and topped with parmesan cheese". Win liao lor. The poached egg + bacon+ cheese in the description already sold me the dish. Seriously, those poached eggs made everything taste better. This was one of my favourite dish of the night. Consisting of farfelle, tiger prawns, clams and scallops in spicy Thai green curry cream, this Sawadee Seafood Pasta was such a delightful fusion! I found myself constantly digging my spoon into those bow-tie pasta, even though I was still chewing on those scallops and prawns. The green curry cream is really addictive! The BBQ Pork Rib was done really well - soft, tender, with the meat sliding off the bones. Glazed with their homemade barbecue sauce that is infused with Indonesian spices, I found the taste just right. It wasn't too salty and had a nice smoky flavour to it. This can really give other BBQ pork rib specialty restaurants a run for their money. And a special shoutout to the AWESOME FRIES that came along with the ribs. OMG the fries were perfect. They were crispy and retained their texture even after a while. The cajun powder that seasoned the fries made these yellow strands incredibly addictive. I was surprised at how addictive they were, because I suddenly commented "Eh these fries are really good ar!" out of nowhere. Everyone just looked at me with a bewildered face, until they had a few and agreed with me. Phew. I was looking forward to this seared sirloin steak that is served with brown sauce, summer vegetables and roasted potatoes. The steak was done medium for us, and I thought that the texture was pretty tender and juicy. The desserts.. damn they were so good. Honestly, I wasn't expecting much from the desserts. But when I had my first mouth of the creme brulee, the wonderful sweetness from the caramelised sugar and custard cream hit me like a train and my dessert senses were craving for MORE. The Thai Tea Lava cake was another interesting dessert concept. Instead of the usual suspects (eg. chocolate/matcha), Bistro Kai actually infused it with Thai tea, which happens to be one of my favourite flavours! "Literally my face when I had the desserts"
PROMO: Quote "ChillAtKai" to enjoy 10% off your total bill! The food quality here was really good and they are priced reasonably. And that is all we really want for our food, isn't it? 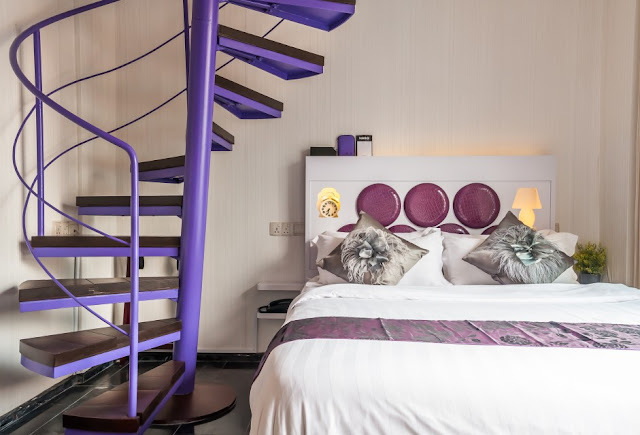 If you are also interested in their rooms, Hotel Kai actually offers really reasonable room rates in Singapore standards! Of which, we were all really interested in their Urban Skyloft. It is a 2-level room and has an outdoor balcony which will be perfect for those birthday parties! It's a place where you and your friends can sit around and chill with a glass of wine, while looking at the beautiful skyline at night. At $350/night, it is really wallet-friendly as compared to other hotels that has a balcony. I know where I can hold my birthday parties now. Thank you Elaine for the invite and Bistro Kai for being such a kind host! Wow! A cool place to unwind and enjoy good food. Love the fresh oysters. Slurp.